This week with Illustration Friday the theme is “Ink”. My inspiration came from Nose Hill Park, where I visit every day to stay healthy, mentally and physically. This natural park area is 11 square kilometers, a vast amount of wildlife live there including birds. Every Fall season, Crows migrate south, and there are huge congregations of them that meet on the hill. It seems that the Magpies can be very curious about their travel plans and try to slip into the murder of crows unnoticed. But, really crows know their kind and usually scream at the crow want-a-be to get out. 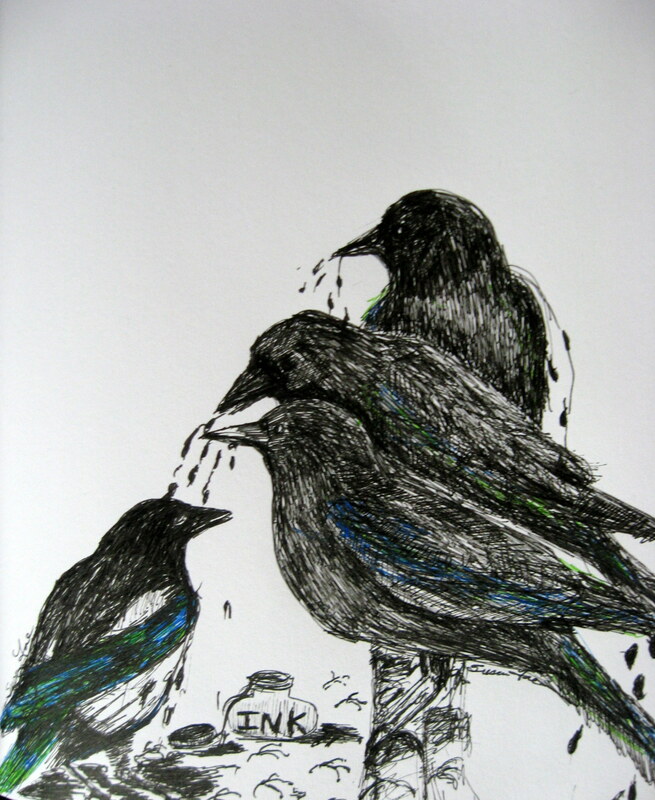 It is fascinating to watch, and create stories like I did here with the Magpies spilling or dripping ink onto each others to camouflage their beautiful coloured feathers, in order to slip into the black crowds of crows. Magpies trying to disguise themselves as Crows. My pen & ink drawings are on 9X12 white sketch paper. This entry was posted in Art Education, Illustration Friday, portrait photography, Susan Fae Art and tagged art for fun, Bird art, Calgary, calgary artist, canadian artist, children's illustrations, crows, magpies, original art, pen and ink, Susan Fae Art. Bookmark the permalink. These drawings are so great. You’ve really captured the magpie spirit! I love Nosehill Park. We used to visit it all the time when we lived near there. It is such a treasure within the city! Thank you Linda, I’ve been enjoying the Illustration Friday drawing exercises. You are so right about Nose Hill Park, my dog and I have made it a daily ritual to visit. So good to hear from you..